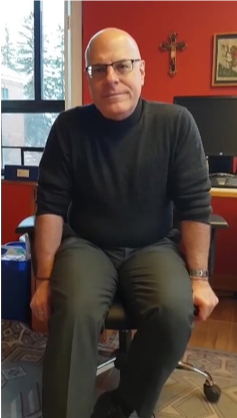 It is difficult to imagine a better fit for the Chair of the Committee for Illumination for The Saint John’s Bible project than Fr Michael Patella, OSB. As a biblical scholar and Professor of New Testament studies at Saint John’s University and its graduate School of Theology and Seminary in Collegeville, Minnesota, he has long been interested and influential in the interplay between Word and Image (the title of his book published on The Saint John’s Bible in 2013). He believes biblical scholarship and the imagination naturally go together, and he sees the Word of God and the arts as mutually relevant and informative. I was a student of Fr Michael’s while I attended Saint John’s School of Theology and Seminary and can attest firsthand to his energy, enthusiasm, and expertise when it comes to biblical studies, theology, and art. I was fortunate indeed to sit down recently with him in conversation about the project and his own experience with it. The first mention of this project to Fr Michael was a covert one. 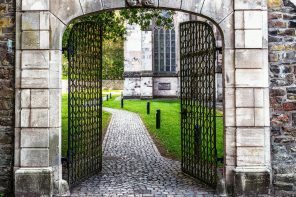 He and, unbeknownst to him at the time, other theologians and scripture scholars at Saint John’s were sent a letter requesting their presence at a meeting to discuss this potential project and provide feedback. They were asked not to mention the meeting or this proposed project to anyone. 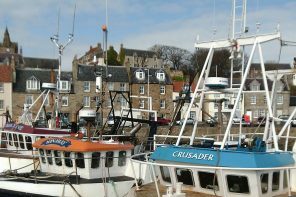 Fr Michael portrayed the setting with great intrigue as he recounted an encounter on the way to the meeting. 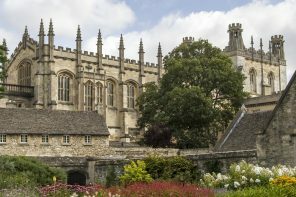 In one instance, a couple of invitees, running into each other on campus on the way to the meeting, eyed each other curiously, not wanting to break confidentiality. Finally, one asked, ‘Are you going where I’m going?’ And the other coyly responded, ‘That depends, where are you going?’ As they neared the meeting room, they exchanged knowing glances. At the meeting, University President Br Dietrich Reinhardt, OSB, explained that a Task Force Committee had formed and had launched project planning and fundraising initiatives. A group of theologians and biblical scholars from the university had been called together to provide opinion on the project. It was agreed that good scholarship was important in selecting biblical passages and that a Committee for Illumination and Text (CIT) of The Saint John’s Bible be formed, to include this group of theologians and scholars as well as artists and historians. As Professor of New Testament at Saint John’s, Fr Michael was named its Chair. The initial group of theologians determined that the selected passages should be roughly based on salvation history, especially texts relevant to those heard at Easter Vigil. Only two weeks later, after meeting daily for two hours, two ad hoc committee members, one for the Old Testament, Fr David Cotter, OSB, and one for the New Testament, Fr Michael, finalised agreement on which passages would be illuminated as well as the size of each. These two scholars completed a schema for the rest of the CIT to approve, which they did. According to Donald Jackson, a full-page illumination would take 20 days to complete, and smaller illuminations were calibrated accordingly. Once this information was known, benefactors were motivated to contribute, grants were sought, and other fundraising efforts diligently pursued. While those on the committees were instrumental to the successful completion of the project, Fr Michael singled out Br Dietrich as the lynchpin along with Jackson. Committed and hard-driving at times, Br Dietrich for the university and Abbot Timothy Kelly for the Abbey were strong leaders with strong visions, and Br Dietrich knew what he wanted to see from the committees, illuminators, and scribes. ‘The Saint John’s Bible simply would not have been completed without Dietrich,’ he commented. 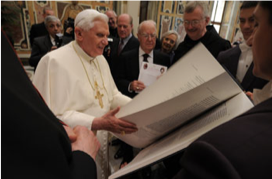 Br Dietrich died in 2008, but not before he was able to see five of the seven books completed and present special editions to two popes: a limited edition, full-size reproduction of Gospel and Acts to Pope John Paul II in 2004, and the Wisdom Books to Pope Benedict XVI in 2008. A large photo commemorating the former event hangs prominently as part of a collage at the entrance to Sexton Commons on Saint John’s campus. Each illumination began with a written brief prepared by the CIT. When asked what kinds of challenges the CIT faced, Fr Michael identified a kind of translation challenge somewhat unique to an illuminated Bible. ‘One of the biggest challenges was finding a vocabulary that an artist could understand. Academics are very wordy’, he commented. Exploring this particular intersection or encounter of artist and theologian is at the heart of the Institute for Theology, Imagination and the Arts as well. ITIA’s TheoArtistry initiative, launched in 2017, saw theologians collaborate with composers and poets to produce works interpreting biblical themes and passages. It is encouraging indeed to know that ITIA contributes to the continuing reception and interpretation of Scripture in the unique ways that art affords. 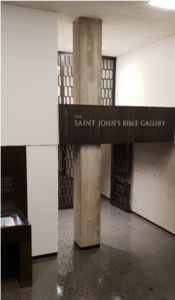 The true influence and significance of The Saint John’s Bible was not fully understood until some of the first pages were publicly displayed at an exhibit at the Minneapolis Institute of Art (MIA). ‘The enthusiasm of those who visited the exhibit was exhilarating’, Patella said, and he indicated his own excitement for the project escalated. He noted his own experience of the exhibit the day he gave a lecture on The Saint John’s Bible there. When arriving before the opening of the MIA that morning, he noticed another unique and beautiful quality of the pages. ‘The text looked like it was floating on the page’, he commented. Indeed. After my visit with Fr Michael, I ventured over to Alcuin Library, the newly renovated library at Saint John’s University where The Saint John’s Bible Gallery was built to permanently house and display the original pages, and I was intrigued at the way the light caught the gold leaf in the illuminations and the text seemed to stand up on the vellum pages. Fr Michael describes the theology of The Saint John’s Bible as incarnational. ‘It is the Word of God taking shape and form in art, beauty and inks’, he commented, and he added that theology, the Bible, and the arts are at the frontier of new, relevant scholarship and interpretation. He commented, ‘Interplay between art and theology is always there and is going to have to be there. Art itself is metaphor, and at the basis of metaphor is analogy. 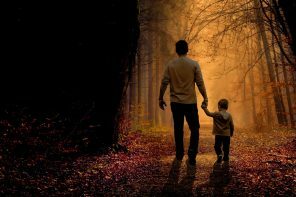 Good theology is not only analogical but also metaphorical, and we try to express that metaphor through analogy, so I don’t think it is possible to do theology without metaphor or analogy. . . and therefore, we’re in the art world, the music world, the literary world’. 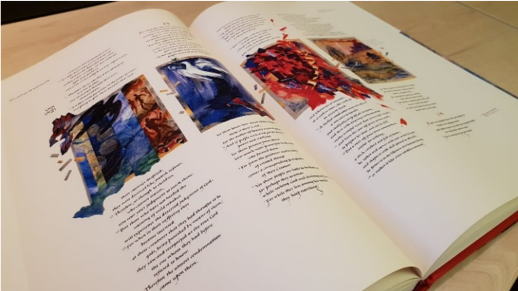 In our conversation and in his book, Word and Image: The Hermeneutics of ‘The Saint John’s Bible’ (Liturgical Press, 2013), he uses the term synesthesia to describe the interpretive interplay of the Bible and the arts, the text and image. Synesthesia is a psychological term that describes stimulation in one of our senses which prompts stimulation in another. ‘Our interpretation of Scripture is bathed in the senses’, he writes. Visual arts and performance, as well as ‘smells, tastes, music, and poetry intermix in providing an experience of the sacramental metanarrative’. 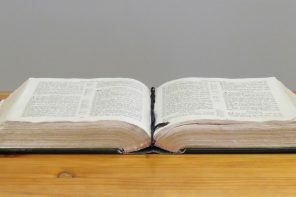 The Word of God creates Scripture, we interpret it as we read or encounter it through other senses, and then interpret again in the way we live our lives and worship, fueled by its message. Fr Michael indicated this project shifted the way he taught as a Professor of New Testament, both by incorporating text and image exegesis into his work and his course syllabi, and by influencing his own new insights into the texts. It is indeed exciting to think of the ways The Saint John’s Bible may influence biblical interpretation and theology. Reception history over the centuries influences each ‘next’ generation and becomes part of the faith tradition. Fr Michael writes, ‘In the ancient mystical tradition, the reading of Scripture and the participation in the sacramental life were the primary ways of humans endeavoring toward a union with Christ. These means are still open to us today and we should avail ourselves to them’. He has noticed a shift in the attitudes of his colleagues in the Society for Biblical Literature (SBL). 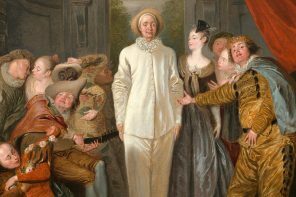 ‘People are realising more and more the importance of art with biblical literature – it is instrumental in biblical scholarship’. 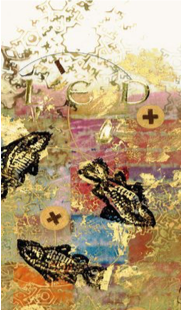 Fr Michael indicated two of his favourite illuminations are the Multiplication of the Loaves and Fishes in the Gospel of Mark and the series of images in the illumination at the beginning of Wisdom 13. He appreciates what these and the other illuminations in The Saint John’s Bible leave to the imagination. ‘Some religious artwork leaves very little to the imagination’, he said, ‘but the beauty of The Saint John’s Bible illuminations is what we each see, what we each take away from it’. In this way, art can also uniquely ‘evangelise’. At the end of our conversation, Fr Michael shared a story of a young atheist undergraduate student of his who experienced a spiritual transformation on a study abroad program on the art of the Greco-Roman churches in Italy, France, and Germany. Upon her return, she asked Fr Michael how she could become Catholic, because ‘her whole life she was told there is nothing there [in a church], but every time she went in one, she found there was everything there. And that’s what she wanted’. 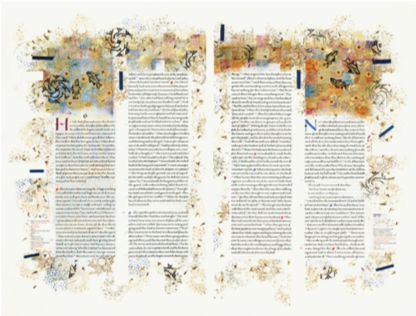 This is exactly the kind of impact that Fr Michael sees art having through The Saint John’s Bible. ‘This is how art evangelises. It pulls you in… you get caught in a current. And that’s what I would like to see The Saint John’s Bible do’. Pope Benedict XVI Photo credit: Copyright by Photographic Service, L’Osservatore Romano. Multiplication of the Loaves and Fishes, Donald Jackson, Copyright 2002, The Saint John’s Bible and the Hill Museum & Manuscript Library, Order of Saint Benedict, Collegeville, Minnesota. Creation, Covenant, Shekinah, Kingdom, Donald Jackson, Copyright 2006, The Saint John’s Bible and the Hill Museum & Manuscript Library, Order of Saint Benedict, Collegeville, Minnesota. 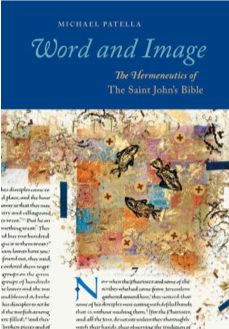 Michael Patella, OSB, Word and Image: The Hermeneutics of ‘The Saint John’s Bible’, (Collegeville, MN: Liturgical Press, 2013), xi. 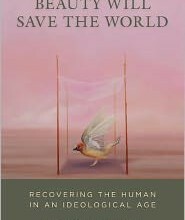 A Review of: Beauty Will Save the World: Recovering the Human in an Ideological Age, by Gregory Wolfe Wilmington, DE: ISI Books, 2011. 278 pages.